The matriarch of the A-5 Deluxe Fullsize Quicksnap has finally arrived. You asked for and here it is. None other like this holster before. Hudson Manufacturer tested and approved of this holster. The NEW Vertical Draw Deluxe Full-Size Quick-Snap holster is hand crafted with double military directional steel snaps on each leather strap for double the security. Features about the A-5V: leather reinforced mouth piece to help retain the holster opening for easy re-holstering. 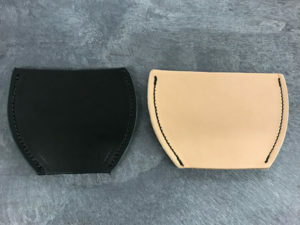 Sweat shield or body shield is a key feature to help protect you from the sharp edges on the weapon; while also protecting the weapon from your body oils and sweat. The New Vertical Draw Deluxe Full-Size Quick-Snap fully conceals the full length of the weapon while carrying OWB. 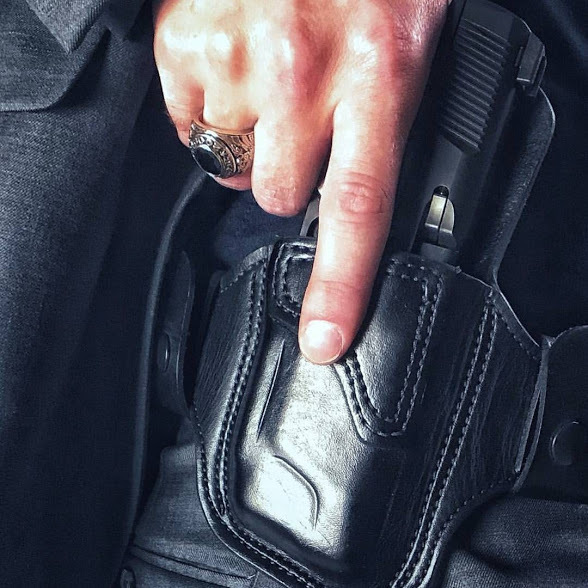 Each holster comes with a deep mold of the outlines of the specific firearm, which is only done by a technique called hand boning. This technique is created by one of our professional leather craftsman to ensure a proper fitment of the weapon for long term use. The A-5V Vertical Deluxe Full-Size Quick-Snap is a major step up from our original design B-3 and B-4. This is the 4rd generation of this type of holster from us. 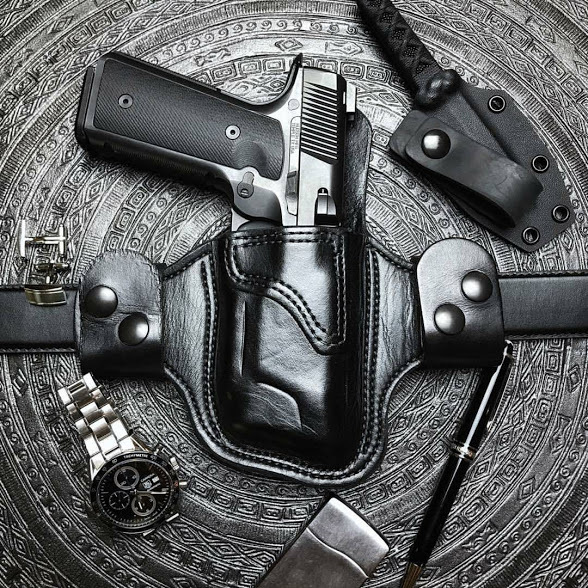 This gives each generation of holsters a major difference in function, features and feel. One of the main differences between the A-5 and A-5V, is the A-5V Vertical Draw Deluxe Full-Size Quick-Snap holster has no cant (15 degrees) to the weapon. 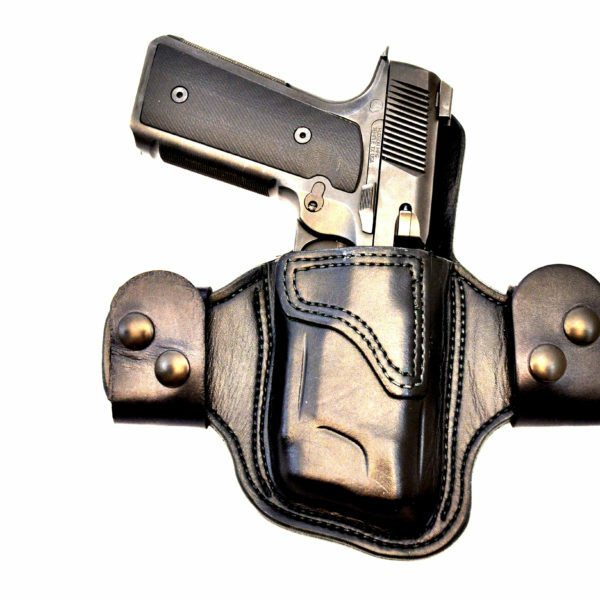 The holster will be positioned straight up for a vertical draw, similar to our B-3 and B-4 holster. The A-5V features a slight wider profile in width to enable a nice comfortable contouring of the holster to the body just like the A-5. This will create the weapon and holster to stay concealed against the body. The profile of the holster will be less noticeable under a shirt. FYI: The straps may be turned in the opposite direction, by using a screw driver to undue each snap from the strap. This will give you the option to unsnap the strap by pushing from the top of the strap or by pulling the strap from the bottom. Choose which way works best for you; it’s a preference of choice. Keep in mind the leather belt loops/straps can fit up to 1-1/2 gun belt (2 layer ¼” thick) or 1-3/4 regular belt (1 layer thinner belt). 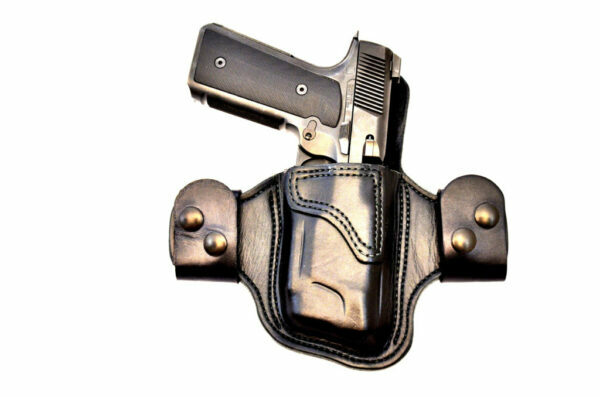 **The additional picture provided is one of our most popular selling holsters. It’s mahogany color with tiger shark trim.